Let me ask you something, are your choices yours? Your choices are yours to an extent, yes, but majority of them are not. In fact, there are 4 Writers that make your choices for you, that write your story and narrative. The first writer are your Core Urges. We evolved from primitive creatures and survival was our main and only purpose for millennia. The programs and coping mechanisms we needed then are not necessary now, however, they still play major role in our life. Just imagine how powerful these programs are. They have been with us for millennia. Many of these primitive programs are a part of us and give us our core urges. These core urges can be so powerful that literally take control over our life and our decisions. Being a part of our DNA and nature they are really hard to override. In times when survival and reproduction was the main goal of our species these primitive urges helped us evolve to where we are today. But most of them are just old programs. We don’t need to stress so much in today’s society, but we still do. We don’t need to be so hostile. We don’t need to be so obsessed with reproduction this extremely, but we are. We operate through these programs and imagine monsters where there are none. Yes, we shouldn’t to neglect our nature and natural urges, but we don’t need to let these programs control our lives to such extent in today’s world either. The core urges will keep writing your narrative and controlling your decisions like your are in primitive times if you are not aware. They are there even before you are born. And as soon as you are born the second writer appears. The second writer are your Core Beliefs. Your core beliefs are created as a result of your energy saving mechanism. Because you don’t have time and energy to question everything all the time you need a basic scheme of how the world works. This basic scheme is given by your family, by experience, by the media you watch, by the things you educate yourself with, by your environment, by stories and filling the blanks. As soon as you are born your family gives the blueprints for your narrative. Your mother and father figures are literally your gods when you are a baby. These figures teach you how the world around you looks like and how it functions. They give you basic knowledge of how to survive, basic knowledge of love, relationships and the world in general. They mold the behavior of your energy through their behavior at home. These two figures and their relationship give you the first context of your story. Then, come the rest of your family and the code of your DNA and all these things add up to write the blueprint of your narrative. As you grow up the environment starts to play a rile too. Your teachers, friends and partners, all of their writings can influence your narrative. Your core beliefs fill up the blanks whenever you don’t know the whole story. They create meaning and order in midst of the unknown. But most of them are not reality. You can live your whole life not even questioning your core beliefs and think they are true, while they give you a distorted image of reality. And most of the time that’s the reason why we get hurt so much. We assume things that are just not reality, we project characters on others that are just figments of our own psyche. And when they fail to live up to them, we are disappointed and hurt. Here is how the third writer is created. The third writer is your Pain Body. As we get hurt we don’t want to face that pain so we try to neglect it. We suppress it deep inside our subconscious mind and leave it there. But as this pain accumulates it takes a grip of our subconscious mind and becomes a force that dictates most of our choices. We are not even aware of it. Our pain body makes us stress about things that do not need stressing. It makes us hate people, assume things, have prejudices, twist our desires, hurt others. Basically it gives us a role of a victim. It make us think the world is against us, like everyone is plotting something, making us forget that we are all trying to do our best. It becomes the spawn point for our triggers. It creates emotional triggers so strong that sometimes we don’t even think rationally. We just react. Our pain body makes us try to fill a void that cannot be filled. It does so because we want to heal ourselves, but we cannot heal ourselves neglecting the pain body and trying to cater to it. So we keep filling an endless hole, chasing our tail, thinking we are victims of the story these writers have created for us. And through all these the fourth writer emerges. The fourth writer is your own EGO. It actually integrates itself into the story and plays the role of you. It creates an image of everything that’s positive and good based on what the other 3 writers wrote. It’s against anything that’s reminding you of your pain body. It’s always the hero of the story. Your EGO makes you chase things that you might not even really like just so it can prove itself to the world. Or, just so you can compensate for something that hurt you in the past and you suppressed into your subconsciousness. It’s alone. The hero that plays for itself, not caring that we are all in this together, caring only about itself. Whatever threatens to change the narrative of the first 3 writers it’s a serious threat to the ego. Whatever tries to expand your limits and possibly change, improve and evolve you it’s a threat to the EGO. Even though the narrative is severely limiting to you, the EGO will fight to protect it, mindlessly, even hurting the people that love you. Because the EGO is a spawn of the story, changing of the story means death for the EGO. That’s why it will portray itself as you and try to control everything. If you try to push your limits, leave your comfort zone and possibly grow the EGO will use your fears against you. It will exaggerate them to stop you. Your EGO might become your biggest limit for growth and evolving. But you are not your EGO. The story is not about your EGO. The narrative is not controlled by the 4 writers. There is a fifth writer, an editor that has the power and control to write any story it likes. The fifth writer is you. You have the power to change the narrative of your own story. You have the power to see your parents as what they really are, two people who have tried their best with what they knew. To see your friends, teachers and partners as human beings that do not know everything. To try and see how the world really works in reality without assuming things. You have the power to evaluate your core beliefs and see what are limiting for your growth. To question them and replace them with ones that serve you. You have the power to dive deep into your subconsciousness and see your pain body. To acknowledge it and feel it. To heal it. You have the power to change your EGO, to see it as what it really is, a hero of a story but not the reality of you. 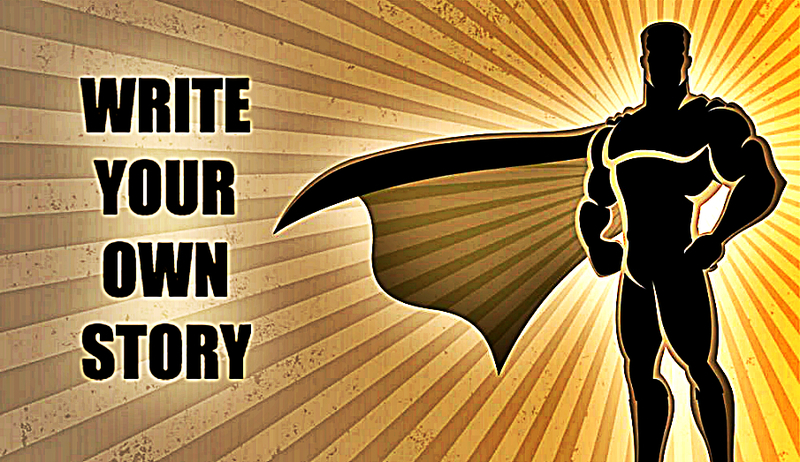 You have the power to write your own narrative. That’s what being a Superhuman is all about, transcending the chains of the 4 writers and taking the power in your own hands to write your own story.